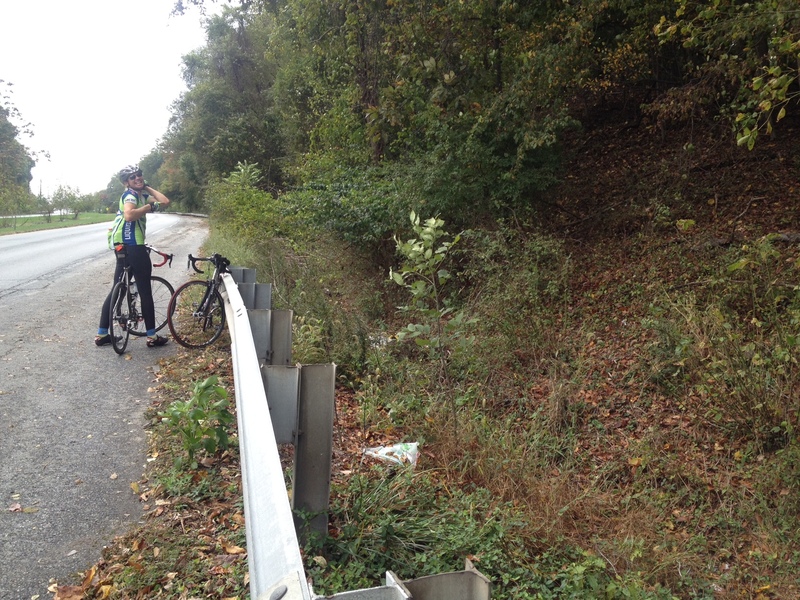 Today’s post is from Lisa, a Takoma Park, Maryland, rider and coffeeneur. When she mentioned that her 39-mile coffeeneuring ride this past Saturday did not quite go as planned I was intrigued and solicited a guest post. And what we have here, my friends, is a story of two coffeeneurs who will stop at nothing for a cup of coffee. Haider had plotted a route north from my house that kept us mostly off of main roads, and we loved Second Avenue in Silver Spring and some of the side streets near Norbeck in Olney. The part on Connecticut near Aspen Hill and turning onto Georgia wasn’t as much fun, but it wasn’t dull! Sadly, Haider’s bike was plagued with brake rub and we had evening obligations so despite the joy of discovering a new route in a familiar place, we paused at the intersection of Redland and Muncaster Mill. We debated the time, our ability to get home before my son left for homecoming, and of course the coffee options. After deciding to call the Mt. Airy part, I looked up nearby coffee shops while Haider tinkered with his brake. Suddenly, the spring shot off and into the parking lot. I was sure it meant a Coffeeneuring Did Not Finish (DNF). Not to be thwarted, he reassembled the brake and eliminated the rub. Yay! No Coffeeneuring DNF for us! But wait, where’s the coffee? Refusing to default to a 7-11, we settled on heading back south towards Kensington. “It’s just a couple of turns to get to Rock Creek Trail,” said Lisa, perking up (pun intended if you want it to be), “Then down to Garrett Park and over to Black Market Bistro. Perfect!” Thirtyish miles instead of seventyish, but under the circumstances, just right. Down Muncaster, onto Avery, past Lake Needwood. The trail turned off on the left. Assuming the “Detour” and “Trail Closed” signs were just silly shutdown artifacts— and those wood planks “paving” the trail just a short nuisance— we forged onward. Onto more wood planks and log construction and wood planks and whoa! A front tire caught in a log tire-catcher, and one of us was down. And up again. We were determined not to let the “boardwalk” stop us! Note: One of us was secretly enjoying it, but didn’t want to let any ‘cross tendencies show. Then it ended. Just ended. There was a creek on our left, a barrier/snow fence on our right, and mulch in front of us. And about 40 feet directly above us? Norbeck Road. There was only one choice: carry the bikes up the leafy, wooded, steep embankment, because going back on the boards was tempting fate. Of course, carrying bikes uphill without a trail in road shoes wasn’t any hazard at all. Bloodied by thorns and really, really ready for coffee and lunch, we collected ourselves on the shoulder of Norbeck, took photos, and pressed on to K-town. 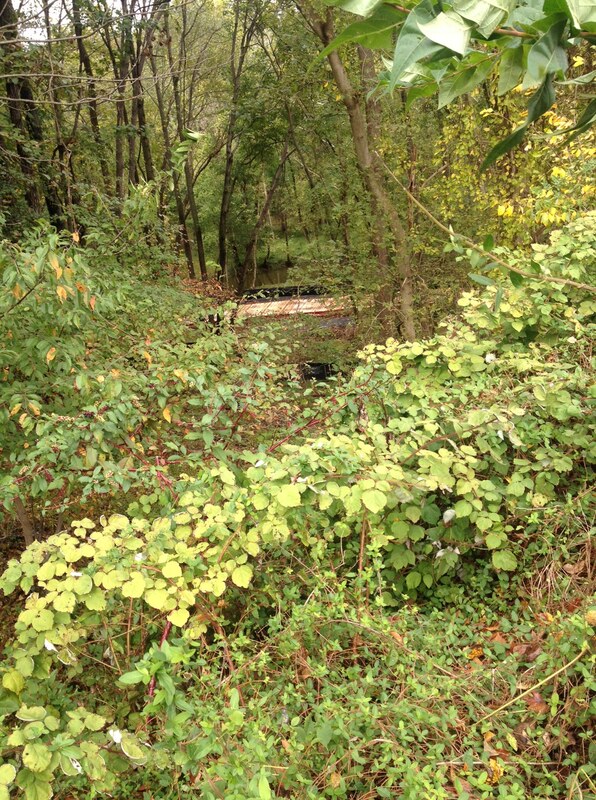 Rock Creek Trail, once we found it off of Twinbrook Pkwy, was leaf covered and wet and great fun on the winding bits. At Garrett Park we turned and headed down the vestigial trail to the house that is Black Market. Oh, yes, please. No, seriously. Between lunchtime and dinner, closed. I went in and looked pathetic—not hard in wet spandex with both legs bleeding. 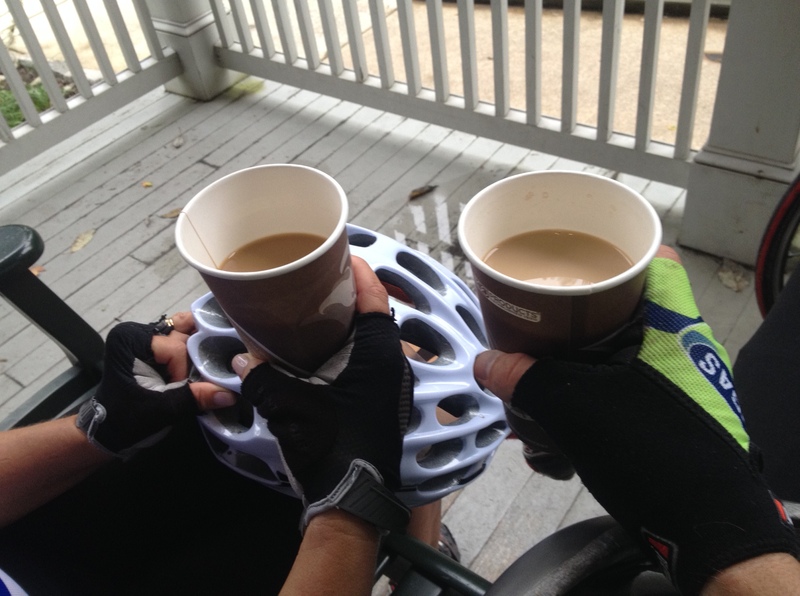 I explained coffeeneuring as best I could, and they actually gave us each a cup of coffee. And took our picture. And were super friendly. We sat out front and had our delicious, hot coffee with some snacks we had brought with. It was a pleasant pause in a rather more adventurous ride than we anticipated. A quick trip down Beach drive and up Kalmia brought us back to the house, slightly damp, properly caffeinated, and laughing uncontrollably (still) about the joys of having everything go awry. Well done, Lisa and Haider! So glad the adventure ended well and with cups of coffee all around. It wasn’t pretty at times, but it sure made for a great coffeeneuring story. And great that Black Market Bistro opened its doors to two weary coffeeneurs. Thank you again, Lisa for guest posting, and may your next outings be somewhat less dramatic! If coffee runs could be epic, this would qualify.